DONATE TO THIS CAMPAIGN NOW! KEEP HELLBENDER & THEIR CREW SUPPLIED! Just south of the “New York” and “Pennsylvania” border a battle is raging to defend the Loyalsock state forest in what isknown as Sullivan County, PA, about a half hour north of what is known as the city of Williamsport which lies at the southernmost part of traditional Haudenosaunee Confederacy territory. The high elevation wetlands, and mature forest ecosystems of Loyalsock are home to rare and threatened species such as the Timber Rattlesnake, Northern Water Shrew, Wild Sasparilla, and carnivorous Pitcher Plants. 114,494 acres of this lush forest sit atop the Marcellus Shale, an underground formation that spans from West Virginia to as far north as Ithaca, NY. Houston based corporation Anadarko Petroleum Corporation (APC) has been craving to penetrate this shale formation. APC has proposed developing 26 fracking well-padsalong with multiple pipelines, access roads, and other supporting infrastructure which are poised to devastate the lively streams that sustain all animal and plant life in the Loyalsock. In nearby, Sproul State Forest, Anadarko has spilled over 12,000 gallons of carcinogenic drilling mud. Andarko was also a key investor in British Petroleum’s Deepwater Horizon oil rig that exploded in 2010 killing 11 workers and releasing 4.9 million barrels of oil into the Gulf of Mexico forever altering the ecosystem. APC was ordered to pay $272 million towards cleaning up the Gulf. Anadarko refused. Twelve people were arrested Friday morning by the RCMP [Royal Canadian Mounted Police] at the site of a sacred fire as part of an on-going protest in New Brunswick over seismic testing in the area. RCMP spokeswoman Cpl. Chantal Farrah said the arrests were made because people were attempting to block trucks and workers. 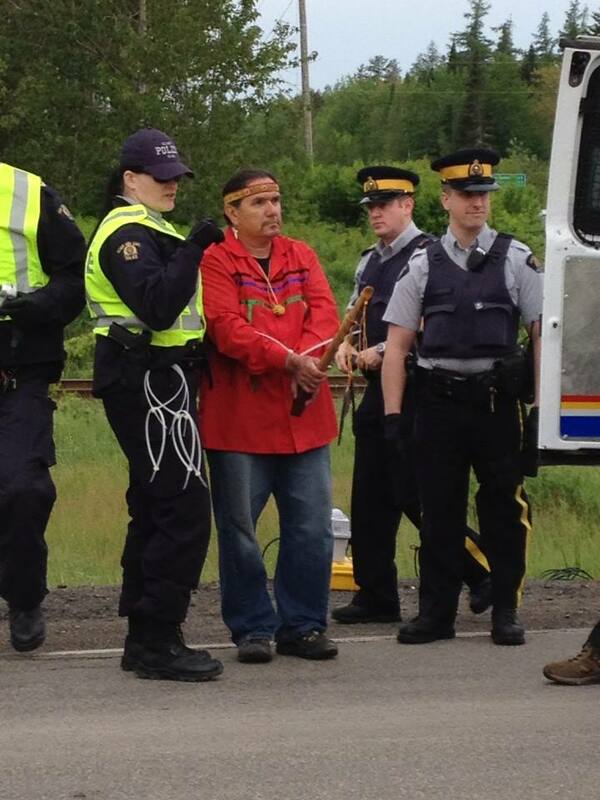 Farrah said seven men and five women were taken into custody on Route 126 outside Moncton near Elsipogtog First Nation. 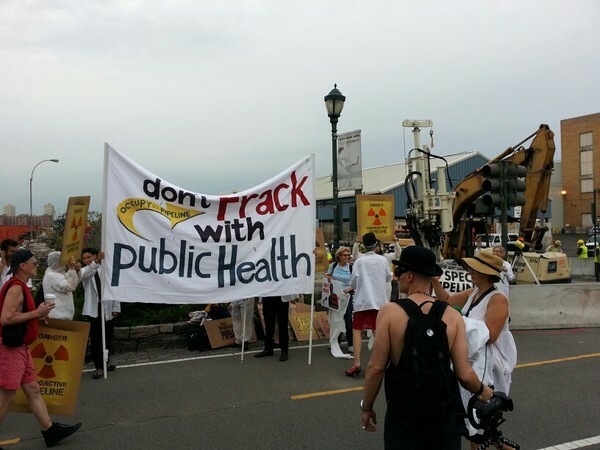 It’s no secret that fracking companies engage in some shady behavior. 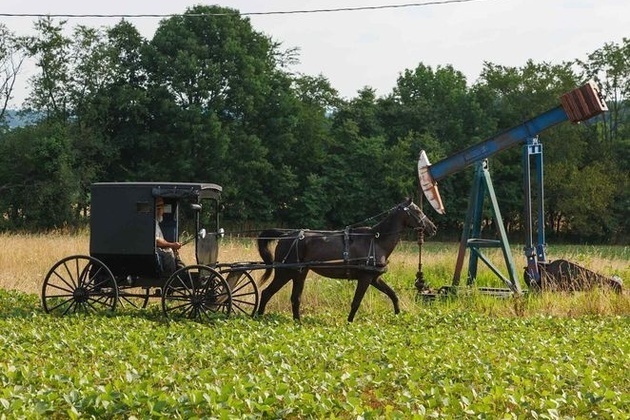 But a report in The New Republic reveals just how low they’ll sink in the rush to exploit natural gas: Energy companies in eastern Ohio — home to the world’s largest Amish population and billions of dollars worth of oil and gas reserves — have been convincing Amish farmers to sign away drilling rights to their land for far less than they’re worth, knowing that because their religious tradition frowns on lawsuits, the landowners will have little recourse for justice once they realize they’ve been duped. Yesterday the ongoing “Spectra Showdown,” turned into the scene of civil disobedience that the group has been anticipating. At least two people have been reportedly arrested. After pre-construction in July, Spectra Energy begins a new phase of construction today that has involved shipments of materials on a barge on the Hudson and from the West Side Highway. Spectra hardhats were seen on people digging at 8:30 this morning right next to the bike path while protesters gathered next to them. A barge with a crane was on the River. The protesters held banners but it wasn’t until after 10 AM that two were arrested. Contaminated water catches fire from gas intrusion. 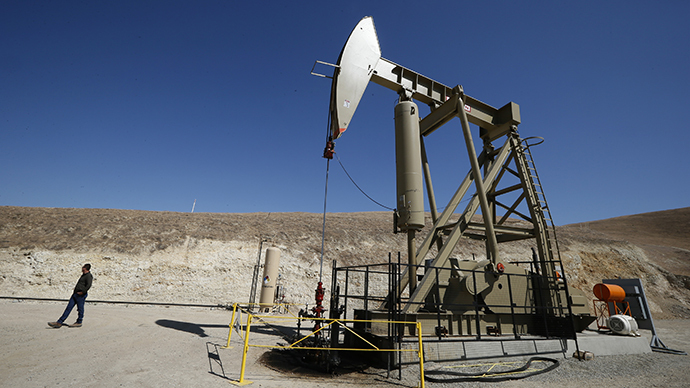 On March 10, New Jersey put a ban on the practice of hydraulic fracking for natural gas reserves. The state is following suit with New York, which instated a seven-month ban on hydraulic fracking on various natural gas drilling sites for fears of water contamination. The bans come in response to alleged water contamination issues being reported from the neighboring state of Pennsylvania, which has been using the hydraulic fracking process to tap the large natural gas reserves recently discovered in the Marcellus shale fields. Various communities throughout the state are complaining about water pollution resulting from the chemicals pumped underground in the fracking process.